Entering Pandaria on your newly dinged alt can be painful, but it can be made easier by buying Panda blues from the Auction House. However, usually when I too check what's available there for my alts, I see nothing but green "trash". I then chose to remedy this myself, and created a bunch of windwool gear with my tailor. I got my caster alts fully decked in rares and while at it, made about 3k profit! You can farm windwool while farming windwool! Even Blingtron paid a visit to my cool farm! This works with blacksmithing and leatherworking too, but I will focus on Tailoring. 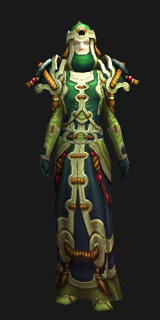 Equippable windwool items are level 85 cloth items with ilvl of 384. Not much gold to be made there, but when crafting one, it can proc a rare version of the item. These have ilvl of 415, which is a massive boost. People want these, not the green quality ones. If you don't have a lot of competition on your realm, you have a great opportunity to make a nice amount of wow gold. You need 525 tailoring before you can create these. They all need 3-5 x Bolt of Windwool Cloth to make. A single bolt needs 5 x Windwool Cloth, which usually costs about 30 gold a stack. That means you can make one item with a stack. If it procs a rare version, you can sell it for even 500 gold if it has nice stats for leveling. That's instant 470g profit! If you get the green version and someone is already selling lots of them, it's usually profitable to disenchant it. Hoods, Pants or Tunics for sale, so those are a good bet. If Windwool is too expensive on your realm, you should farm it yourself! Almost every mob in Pandaria drops cloth, so there's plenty of places to try out. However, these mobs are my personal favourite when it comes to farming windwool, though there's rarely need to kill a thing.